Locations: Montreal, Kicking Horse Pass Spiral Tunnels, Banff, Lake Louise, Crowsnest Pass, Toronto, Chicago, Edmonton, Calgary, Vancouver and more..
Charles Smiley focuses his considerable array of talents on Canada! Vintage Scrapbook contains a cornucopia of rare, color steam films. Early diesels in passenger, freight and mixed train action. RDC cars as well. Locations are all across Canada. Mainline and somewhat obscure operations are here. A very comprehensive overview. Highly detailed coverage from; 1939 and running into 1973. Canadian Pacific Railroad is the star of this show. Canadian National is here, though it has less screen time. Additional lines: Pacific Great Eastern, Quebec Central, Logging Lines, QRL&P Railway, Esquimalt & Nanaimo, Electrics, and CP Ships. Grand Trunk Western, Central Vermont, DT&I, and Soo Line also appear. If you have never seen a Charles Smiley Presents program, this is an excellent one. These are produced with a style similar to a PBS broadcast. An extremely high degree of professionalism, is the standard on a Charles Smiley Presents show. There is so much contained within this program, it promises repeated viewings. There is plenty of history here too. Digitally restored films are a cornerstone on vintage Charles Smiley programs. Yes, the old steam films look fantastic! The early diesels in original paint are equally fine. Great sound accompanies the film and is in stereo! There are numerous custom-made maps to keep track of locations. As we are covering Canada, we’ll need them. Many hours go into the map making process. This is one of the numerous extras that are contained in a CSP show. Amazing, is the rarity and superior image quality throughout the show. The audio jumps right out of the speakers. Very clear, natural steam sounds are quite a treat! There are a wide plethora of steam trains. A rare favorite view, is a diminutive 4-4-0 pulling full length Canadian Pacific passenger cars. The big road locomotives are included. There are plenty of viewpoints to see these classics. Many trains operating in the fabulous 1950’s. This collection of big-time CP and CN is worth the price of admission. A Central Vermont feature fits nicely here too. Outstanding! Electric fans will enjoy a visit to old Montreal and the street scenes, in color. Deux Montagnes is the CN suburban operation. Update to 1970 shows modern diesels. Board a CP Rail train headed westbound. Breathtaking scenery and attention to the old stations make for a memorable trip. 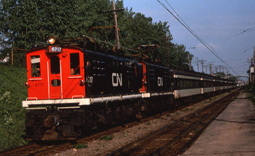 Early 1970’s with : GT, DT&I, Soo Line in the US, are featured as affiliated Canadian lines. We resume our Canadian visit, travelling westbound cross country. Where does he obtain the pretty 1939 all color footage? Offering history of the Canadian Pacific beginnings of Air Canada, with 16mm film to boot. A 1938 Beachcraft with aerial shots and take-off. Wow! Some splendid scenery is featured, along with hotels and stations, at Banff and Lake Louise. The progression to Kicking Horse Pass with steam era trains is spectacular! Double and triple- headed passenger trains look awesome on the mountain grades. A 1970 cabride, aboard a CP Rail F-unit led Canadian, through the spiral tunnels is fantastic! Charles is one sharp producer. Notice how he effortlessly segues between 1973 and vintage 1950’s films. Smooth transitions and even smoother narration. All the while, providing historical and modern information. Our transcontinental journey arrives at Vancouver. A look at the port and some of the CP ships ends the main portion of mainline CP and CN action. There is so much more to be seen on Canadian Rails Vintage Scrapbook. The Pacific Great Eastern is another fine chapter. 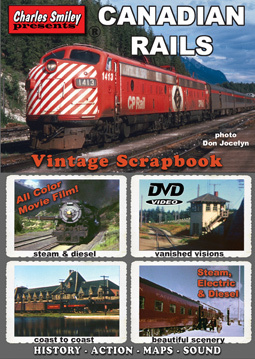 Canadian Rails Vintage Scrapbook- is a must have for railfans of all ages. It provides enough history as a primer for railroad history in Canada. A wonderful program! This entry was posted in ATVR Reviews, Charles Smiley Presents, Steam Train Reviews and tagged American Train Video Reviews, Canada, Canadian National, Canadian Pacific, electric, Grand Trunk, new releases, PBS style, Railroad, Train DVD, transportation by William J. Hudson. Bookmark the permalink. Hi Dennis, Nostalgia seems to be a large part of the appeal of vintage trains. You have some great railroad history, via your family. Thanks for sharing.